Your child got into the college of their dreams. But the acceptance letter didn't mention any kind of scholarship. Now what? The good news is that most students receive some financial help paying for college, bringing the cost down from the school's "sticker price." At the average private college, for example, the sticker price for tuition, room and board was $45,370 last year. But the average student actually paid $26,080, according to The College Board. At public colleges, the sticker price was $20,090, but the average in-state student paid $14,210. Even without a scholarship, there are plenty of other forms of aid that can help you tackle the cost. The financial aid system can be confusing, so don't feel bad if you're a little unclear about how it all works. There are scholarships and grants (which you don't have to pay back), and loans (which you do). Some of what you receive is based on income and some can be based on academic merit. Colleges, states, and the federal government give out grants, which don't need to be repaid. Most are awarded based on your financial need, and determined by the income you reported on the Free Application for Federal Student Aid, or FAFSA. If you've received a grant, it should be listed on the financial aid award letter sent by the school. This might have arrived with your acceptance letter, but sometimes it's sent later. Last year, undergrads at public colleges received an average of $5,000 in grant aid and those at private colleges received about $16,700, according to The College Board. The biggest grant awards usually come from the the college itself. Colleges will take into consideration how much they think your family can afford to pay for college and try to fill in the gap with a grant. Some pledge to fill in more of the gap than others. Federal Pell Grants, on the other hand, are capped at $5,920 a year and most go to families who earn less than $30,000 annually. Eligibility for state grants vary. 2. Ask the college for more money. Yes, you can haggle over financial aid. Experts suggest having the student write a formal appeal letter and then follow up with a phone call. It's worth reemphasizing why you're a good fit for the school, and whether or not you received more aid from a comparable college. Maybe you can do a better job explaining your financial situation. Sometimes your family might have other expenses, like medical bills, that aren't already taken into consideration. It's also a good idea to mention if your family's financial circumstances have changed in the past year because the FAFSA is based on your income from the prior year. These are part-time jobs on or nearby campus for eligible students, depending on their finances and the funding available at the school. You need to have submitted the FAFSA in order to qualify. Work-study jobs pay students directly, at least once a month. Undergrads earn hourly wages, but the amount you earn can't exceed your work-study award for the year. The amount should also be included in your financial aid award letter sent by the school. If you don't qualify for work-study, it could be worth looking for another part-time job. Websites like QuadJobs and WayUp post jobs online for college students looking for odd jobs like babysitting, tutoring and dog walking, as well as work related to their studies. 4. Apply for private scholarships. There are thousands of private scholarships out there from companies, nonprofits and community groups. Ask your high school guidance counselor or use a free online service like Scholly that suggests scholarships you might be eligible for. A company called NextGenVest offers a free mentor who can also suggest scholarships, as well as help you understand your aid award. Loans should be your last resort, but they're often inevitable if scholarships, grants and savings don't cover the entire bill. The typical family uses loans to cover 20% of the cost of college. You'll want to borrow money from the federal government before turning to a private lender because federal loans offers lower interest rates and more borrower protections. This is yet another reason to fill out the FAFSA. You won't be able to get a federal student loan if you didn't submit the form. But you should be able to borrow regardless of your family's income. First-year undergrads can borrow up to $5,500. 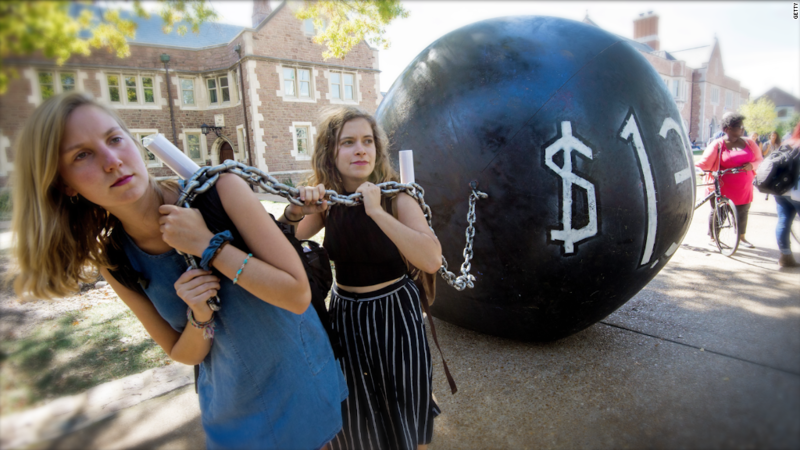 Some students who demonstrate more financial need will be allowed to borrow subsidized loans, which won't accrue interest until after they graduate. Another type of federal student loan, called a PLUS loan, allows parents to borrow to help their child pay for college. PLUS loans require a credit check and come with a higher interest rate. The school will determine how much a parent can borrow, but the amount is supposed to cover the cost of attendance minus any other financial aid you get. Once again, the financial aid award letter from the school should tell you how much you're allowed to borrow each year from the government. 6. Claim a $2,500 tax credit. The American Opportunity Tax Credit allows you to reduce your taxes after paying for tuition, fees, books, and room and board -- up to $2,500 a year per child. Parents can claim the tax credit if their modified adjusted gross income is no more than $90,000, or $180,000 if filing jointly. 7. Live off campus or enroll in community college. If commuting to school and living at home is an option, it can save a lot of money. The average cost for room and board is $10,440 at public colleges and $11,890 a year a private institutions. That can be just as much as the cost of tuition at some schools. If your finances are really stretched thin, it might be worth exploring enrolling in a community college before transferring to a four-year school later. Tuition and fees at the average community college cost $3,520 last year.